With Spring finally here we thought it was time for us to finally get organized and restart our weekly Kids in the Capital playdates! Yay for Spring! From now until the Fall we will be hosting weekly playdates every Friday morning from 9:30am to 11:30am at St.Luke's park in Centretown. It's a chance for readers to hang out, watch the kids and chat. St. Luke's is just off of Elgin which means coffee is close by, as are bathrooms. Don't forget to bring swim suits in July and August because the wading pool opens at 11:30am! Playdates will be cancelled if it is raining! We hope that you and your kids will join us! Spring break is coming and that means all kind of fun activities for kids off from school. It also means disrupted routines and tired parents. Which is why you should join us to a Kids in the Capital parents-only meetup! When: Tuesday, March 15th at 8pm Where:Woody's Pub at 330 Elgin Street Why: It will be fun! by Krista We attended the latest Kids in the Capital children’s get together at Starr Gymnastics’ newest location, at 520 Lacolle Way in Orleans. My husband and I brought our two children, aged 3 and 2, and were joined by about 12 other families. We were excited to check out this location, as we have attended the West End Starr, but had not seen either of the other locations. This was also our first experience with a party held at Starr, which may come in handy for birthdays in the near future. They impressed our family on both counts. It’s a very large bright and open space that was clearly designed to suit Starr’s needs. 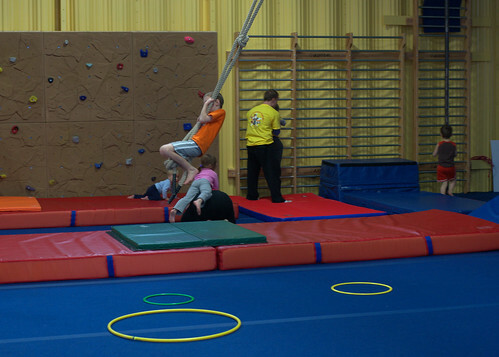 There is a climbing wall, a swinging rope, several mini-trampolines, balance beams and bars, as well as several large open floor spaces for exercises. There is also a nice quiet room in the back of the space, intended for use by parents with really young children, and a raised area where there are four large round trampolines, and a foam pit for the children to dive into. There are also slides, mini-trampolines, balls, hoops, bean bags, and small play equipment spread through out the space. The children were divided by age, with those under three heading off in one group with their parents, and those over three heading off without parents. The party was held much like one of the regular instructional classes, starting with a warm up, followed by activities that were geared to age. There were at least two leaders with each group, and they instructed the children (and parents) at the start of the activity, and then left them to their own devices as they tried out the new things. They were always close by and available to step in if assistance was needed. The activities were generally high energy, and the focus was to keep the children moving. They switched things up every ten to fifteen minutes, allowing for the children to try out each station. There were clearly some favourite activities, with most of the younger ones - and some parents - loving the big trampolines and the foam pit, and some of the older kids liking the climbing wall and the “Tarzan” rope. The focus was on keeping the children moving, so other than the brief moments when instructions were given, everyone was active for the full hour. All in all it was a great experience. The children got to try new things, were active for an hour, and had lots of fun with new friends. The staff members and leaders were very helpful, energetic, and constantly encouraging their charges. I would definitely go there again, and would consider hosting a party for either of my children. There were two things that I would like to change, the first being the volume of the music, so the leaders didn’t have to yell to be heard by the children. The second is the flow in the entrance. The way it was set up you sat on a bench to remove you boots, then crossed the very wet floor to hit the play rooms or gym space. This problem will hopefully go away soon, with spring’s arrival. Thanks Krista! Are you a fan of Starr Gymnastics? Would you like a chance to find out? Starr Gymnastics is giving away one two-hour birthday party package, including one hour of gym adventure and one hour in a party room, for up to ten kids. The birthday party package can be redeemed at any Starr Gymnastics location, pending date and time availability. To be entered in the giveaway, leave a comment letting us know which Starr Gymnastics location you would pick for a birthday party. For an additional two entries follow Starr Gymnastics on Twitter and like their Facebookpage. Please leave a separate comment for each entry! The giveaway ends Tuesday February 22nd at 11pm. It is open to residents of Ottawa and the surrounding area. Congratulations to our winner Sara Horton. We are excited to be hosting a giveaway for a party at 4Cats Art Studio. You may remember that we hosted a Kids in the Capital party at 4Cats in December. Here is what Joanne had to say about the party! If you look at the 4Cats Art Studio website that is the first thing you will see is their slogan -The Best, Most Fun Art Studio Ever. So, when the kids asked me about the Kids in the Capital Splatter Party and where it would be held I told them "it is at the the Best, Most Fun Art Studio Ever!" My daughter was thrilled – she loves art – she loves to draw, colour and paint. 4Cats, located in the Hintonburg neighborhood of Ottawa and they offer art classes, workshopsand parties for kids of all ages (and adults too!). 4Cats gives kids the chance to learn about great artists and create their own great art. So, the day of the party arrives and weather was not good. Freezing rain was blanketing the Capital and I told the kids we would have to wait and see if we would make the trek down to Hintonburg to the studio. About an hour before the party, the major roads were good so we headed out on a dark rainy Sunday afternoon to the Studio. Walking into the Studio our gray day became bright and full of beautiful colours. The walls were lined with the most beautiful works of art we had ever seen. The colours were so bright and happy – my daughter was in awe. Something told me that if we are going to a Splatter Partyand we should come dressed for a mess. So, in old jeans and t-shirts the kids got excited for this new adventure – they had done lots of crafts but this was going to be different! We were welcomed by Emaly who took the time to chat with all of the kids and the moms about what we would be doing and the kids got busy drawing on the many sheets of paper that lined the tables. Once everyone had arrived and everything was ready Emaly discussed the various rules about Splatter parties – an important rule is the No Big Deal rule! If you get paint on your cloths... no big deal! If you accidentally splatter paint on your friend… no big deal… in your hair…. no Big Deal! Once the kids were clear about the rules they chose their paint colours and off they went into the Splatter room. Now, the splatter room is a good size room lined with canvas ready to for a mess. Emaly had provided each child with a canvas that they could paint on for the duration of the party. And they began to splatter paint… there was paint flying everywhere…pink, red, green and all of the colours of the rainbow. They were so focused on having fun and were laughing like crazy! It was unbelievable to watch – the kids were hard at work on the masterpieces and having a wonderful time. They could not believe that they were actually able to fling the paint on the walls and not get into trouble. The goal is to make a mess! The messier the better! Parents can watch the mess from a clean area on the other side of a window! Then they began to work on a 6 by 3 foot group canvas. They used their paint brushes, droppers and even paint filled balloons. It was wonderful to watch – each child added a more and more paint to create a wonderful masterpiece. When everything was completed in the splatter room the kids got all cleaned up and were thrilled about their experience. But the fun was not over, Emaly and her assistant pulled out a couple of paint spinners and the kids got to make two little pieces of art to take home. There are a few things if you are going to book a splatter party for your kids that I think you should keep in mind, like if they have long hair maybe try to tie it up so it does not get in their way or into the paint! Also, my kids were dressed for a mess but in good indoor shoes – I would recommend old shoes or even rain boots. The paint is water based so it does wash out quite well. The party was great fun! I asked the kids what they thought of their experience while we were driving home. They said “It was the best, most fun art studio ever!” So, now I know where they got their slogan! Thanks Joanne! Do you think your kids would love 4Cats as much as Joanne's kids did? The 4Cats Arts Studio in Hintonburg is giving away a party package of your choice for 10 kids worth $175. The winner will be able to choose the party they want from options like clay party, Vann Gogh party or pop art party. To enter the giveaway please leave a comment letting us know what party your kid(s) would like the best. For up to two additional entries, follow 4Cats on Twitter and like their Facebook page. Please leave a separate comment for each additional entry. The giveaway ends Tuesday February 1st at 11pm. It is open to residents of Ottawa and the surrounding area. Update: Starr Gymnastics has offered a Free Drop-in Playtime voucher for any of readers that can't make the January 22nd event! To receive your voucher please email info@starrgymnastics.com with your name/child(ren) age(s)/phone number by February 1st, 2011. Don’t forget to mention Kids in the Capital. Do your kids like to climb and jump and run? Do they have more energy then you can possibly ever hope to have? Then have we got a fabulous meetup for you! The Ottawa-favourite Starr Gymnasticsis hosting a Kids in the Capital meetup on Saturday January 22 from 4:00 - 6:00 PM at their Orleans location (520 LacolleWay ). 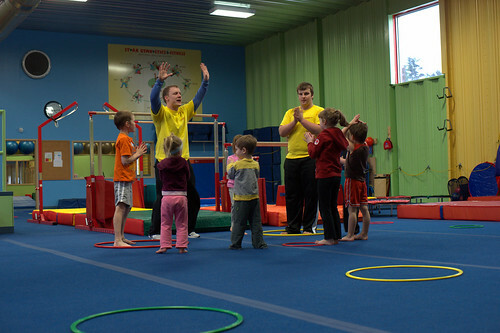 It's a great chance for your kids to discover Starr Gymnastics for free! The kids will get to spend one hour in the gym and then we can all visit for a second hour the party room. It will be a potluck so please bring along your favorite kid friendly snack (no nuts please - Starr is a nut-free zone)! We have room to invite 16 kids. If you and your kids would like to come to the meetup please leave a comment below with the number and ages of your kids. Have your kids taken a class at Starr Gymnatistcs before? Let us know in the comment what class they took and how they enjoyed it. We will send out a confirmation email to everyone attending. And if you are invited and have to cancel for some reason, please let us know. We can't wait to see you all on the 22nd!